In a spirit of advancement and hope, this symposium addresses issues related to gender and diversity from a variety of interdisciplinary perspectives; whether theoretical, methodological, practical or pedagogical in terms of implications. The programme includes keynote presentations, a panel discussion and research presentations. Fiona Hurd (Member of GDRG and lecturer in International Business) will lead the workshop in partnership with Suzette Dyer (senior lecturer, Waikato Management School). This workshop is focused on highlighting practical tools and techniques for introducing Gender (and more broadly critical approaches) to the classroom. The workshop will be interactive and there will also be a collaborative discussion where participants can ask questions and discuss their ideas and challenges. 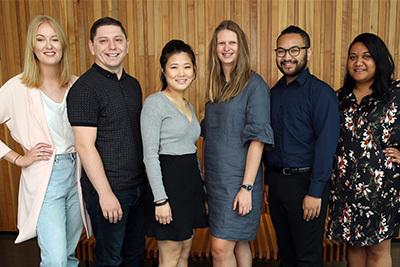 Three streams have been developed by members of the Gender and Diversity Research Group from the department of Management in conjunction with other gender and diversity members from across AUT and also international colleagues. ‘Looking back to move forwards: Celebrating 10 years of the Gender & Diversity Research Group’. Join us for a day to celebrate 10 years of Gender & Diversity Research Group at AUT. This day celebrates our group’s success in the context of increasing challenges to critical, qualitative research and the demise of programmes such as women’s studies courses in New Zealand. We take the opportunity to pause, and think about where we have come from, what we have achieved as a community and to set a research agenda for the next 10 years. This is a full day programme featuring cutting edge researchers and those at the cutting edge of comment in ‘industry’ and society. Nimbus Staniland (Lecturer, Business School and a past recipient of the AUT Vice-Chancellor’s Doctoral Award) lead a panel of past and present postgraduate research students in the Gender & Diversity Research Group. Each student presented the key aspects of the methodology they used, some of the inherent challenges and some of the highlights of their research journey. The Immigration and Inclusion Research Group, the Gender and Diversity Research Group and the Management Department hosted Helene Ahl a Professor of Business Administration at the Jönköping University, Sweden. 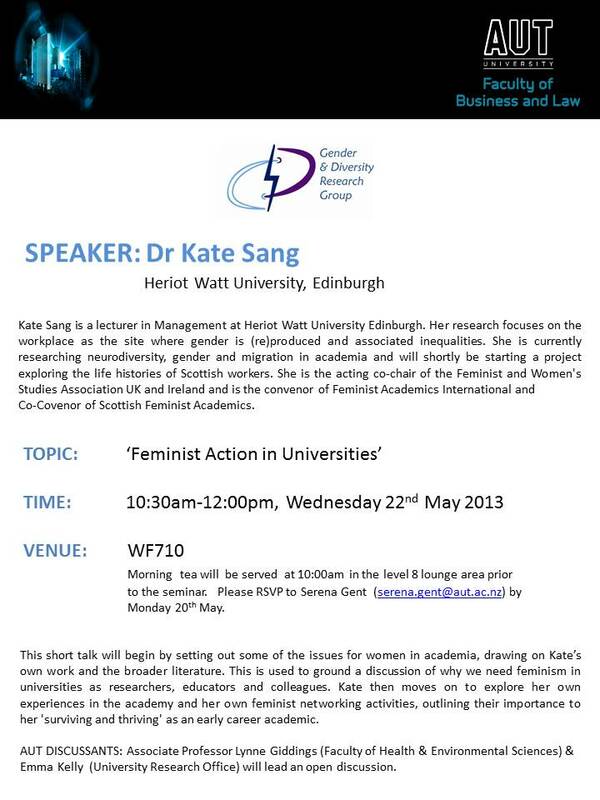 Seminar: Post-feminist times – a brave new world or the same old story? Presented by Professor Helene Ahl (Jönköping University, Sweden). Our time is characterised as post-feminist: women and men now have equal rights, and equal access to education and jobs. If women only work hard enough – if they lean in – there is nothing stopping them from achieving success. 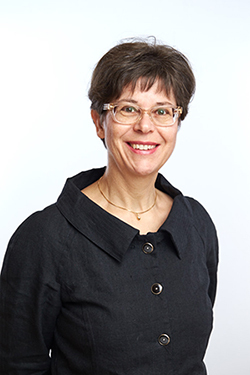 Helene Ahl is Professor and Research Director of the research programme Lifelong Learning at the School of Education and Communication, which comprises about ten senior scholars and doctoral students. Ahl is most well known for her critical, feminist analysis of research on women’s entrepreneurship. Her research also includes work on motivation and adult learning, empowerment, gender in higher education and feminist analyses of government policy for women’s entrepreneurship. At present she leads the research project Embla, on feminist perspectives on entrepreneurship and growth, financed by the Swedish Research Council. Ahl has also evaluated a number of gender mainstreaming programs, and is often engaged as an expert on gender issues. The Gender and Diversity Research Group hosted Professor Marianna Fotaki who presented a seminar on ‘The Good Organization and the role of ethic of care viz: what constitutes a good organization where people are good to each other? Professor Fotaki, from the University of Warwick, drew on the ‘university’ as an organizational model and began her address by asking two questions: where is the hope in academia; and what is the meaning of being a Professor? Her answers to these questions focused on the need for academics to ‘give back’ to individuals and communities and ‘to touch others’ lives for the better’. More specifically Professor Fotaki pointed to the challenges associated with the neoliberalisation of higher education; the persistent nature of gendered work relations in many occupations and the emergence of new societal inequalities. 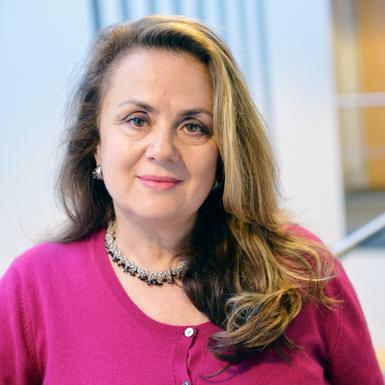 In order to address these challenges at a societal and organisational level Professor Fotaki argued that ‘Feminists’ have a responsibility to challenge existing and newly created forms of oppression and inequality. Professor Fotaki’s own response to this challenge has been to assemble a number of fantastic ‘feminist thinkers and writers’ and give them a voice in her forthcoming book, co-authored with Nancy Harding. Much of the discussion for the remainder of the seminar centred on the call for academic feminists to reclaim their place as public intellectuals and knowledge creators in order to create new spaces and alternative meanings that ‘touch others’ lives for the better’ and ‘reflect a collective ethic of care’, in organisations and society at large. The seminar was a wonderful and thought provoking start to the academic year and was well attended by academic and professional staff and students from across AUT University. November 9, 2016, Sir Paul Reeves Building. Cathy Brigden (RMIT) spoke on her research into women trade unionists in Victoria in the early to mid-twentieth century and David Verran (Auckland Libraries) spoke about the challenges and opportunities of doing historical research on unions in New Zealand. August 30, 2016, Sir Paul Reeves Building. With guest speaker: Associate Professor Janet Sayers (Massey). This one-day seminar included post-graduate, PhD, and early career researchers, as well as a keynote, ‘Feminist CMS writing as difficult joy: Via dogs and birds’, given by Associate Professor Janet Sayers. Topics included Māori perspectives of relational leadership, headscarves in football, microfinance in Mexico, and Tinder use in NZ. Four members of the group (along with international colleagues) convened a stream at the 9th Biennial International Interdisciplinary conference, 29 June to 1 July, 2016 at Keele University, UK. Wednesday May 11, 2016, Sir Paul Reeves Building. With guest speaker: Professor Glenda Strachan (Griffith University) This one-day seminar included post-graduate, PhD, and early career researchers, as well as a keynote given by Emeritus Professor Glenda Strachan of Griffith University, Queensland. Topics varied from the gender make up of corporate boards, to constructions of the transsexual 'Other' in Bangladesh, to representations of (hetero) romantic love in the movie Twilight. Topic: Sexing Indonesia: Reflections on sexuality and gender research over the past (almost) two decades. Topic: Mediated intimacies and the re/fashioning of contemporary heterogender. Date: Monday 2 February 2015. This presentation will explore how diversity gets ‘done’ (Ahmed & Swan, 2006) and which multilevel power processes play a role in doing diversity. It digs deeper into the micro-practices of power used by various change agents to instigate and resist change in their organization. It takes a practice perspective to re-conceptualise diversity as an ongoing dynamic social practice, and sheds light on the various ways in which individuals, as agents, relate to the structural restraints of multiple organisational inequalities. Marieke van den Brink is an Associate Professor at the Institute for Management Research at Radboud University Nijmegen, the Netherlands. Her main research interest focuses on ways (gender) inequalities are produced and countered in organisations, especially in recruitment and selection. Women constitute two thirds of all law graduates yet they make up only 45% of practicing lawyers and 19% of partners (NZ Law Society, 2013). Various explanations are given for the disparities between female and male lawyers, but what do the lawyers say is going on? This seminar reports the results of research initiated by the Auckland Women Lawyers’ Association and carried out by the Gender & Diversity Research Group (G&DRG) through 2012-2013. Members of the G&DRG surveyed and interviewed female and male lawyers below the line (yet to make partner) as well as women and men above the line (who were partners or managing partners). Explanatory metaphors of glass ceilings, leaking pipelines, firewalls and glass cliffs abound in discussions of why women are not in the top echelons of the profession. In this seminar we will discuss the reasons why, despite their love of the law, there is a scarcity of women partners in Auckland law firms today. We share the organisational cultures of large law firms as seen through the eyes of our participants and consider the future viability of the current structure of the law profession. 1.International mobility is a possibility for many people both within and outside the auspices of an organization. For internationally mobile populations, the space in which work is conducted is expanding. What are the opportunities and threats for companies and individuals? 2.Mobility at job, occupational and organizational levels is apparently increasing. For women, structural changes over time have attempted to create career progression opportunities. What potential pay-offs of these opportunities are becoming a reality? This seminar aims to create a time and a space to share thoughts on and discuss these important issues impacting on careers and careers research. Noeleen’s research interests are in the area of career management, both organizational and individual aspects, with a particular focus on career transitions. The development of conceptual and theoretical frames of reference to further the understanding of careers as they unfold in a global milieu is a dominant theme of her work. She collaborates with national and international colleagues in developing a research agenda for the future, through research initiatives and conference participation. She has previously worked as an Occupational Psychologist within the Employment Services, the Royal Mail Group and the Police. Professor Gunnarsson led a participative research seminar on a gender mainstreaming project in a global Swedish technology company. The ’hands on’ gender equality project created sustained change through an innovative process. She will discuss the process of setting up the project partnership, the collaborative research and change processes, outcomes and wider implications. Professor Fang Cooke, Professor of Human Resource Management and Chinese Studies at the Department of Management, Faculty of Business and Economics, Monash University, Melbourne, Australia presented a seminar on Tuesday 27th November, on the topic ‘Gender roles and organizational HR practices: The case of women’s careers in accountancy and consultancy firms in China’. On Wednesday 28th November, Professor Cooke facilitated a workshop on ‘Publication with Qualitative Data’. In this workshop, Fang looked at how the research methods section is expected to be written in a paper when presenting qualitative data, which is a very challenging exercise! Fang will also explore how qualitative data can be presented to tell an interesting story but also in a succinct way to give it a ‘quantitative’ feel. Associate Professor Georgina Murray and Professor David Peetz from the Centre for Work, Organisation and Wellbeing at Griffith University presented a seminar on the topic ‘Gender at work and regulation distance: ‘token’ female groups in mining and elite white collar work’. The seminar was held on Friday 27th April. The Glamour and Grind Research Group presented preliminary findings of a Marsden funded research project in an interactive symposium: 'Glamour & Grind: Creative Careers in the Screen Industry'. Presenters Deborah Jones (Victoria University, Wellington), Judith Pringle (AUT), Rachel Wolfgramm (University of Auckland) and Ella Henry (AUT) will report on the findings from the Marsden funded project investigating the careers of 'new creative' workers, using the New Zealand screen industry as a case study. The symposium was held on Friday 16th March at the Faculty of Business and Law. Research seminar: "But you don't have local experience": Exploring the career impacts for immigrant managers in Australia’. Dr Uma Jogulu, Deakin University, Australia, 25 October 2011. Research seminar: ‘Nice work if you can get it? – Women in emerging industries in New Zealand. Dr Stefan Kesting, Gender & Diversity Research Group, 7 October, 2011. ‘Making managing diversity visible: An Australian study of practice’. Dr Jane O’Leary, Diversity Council, Australia. ‘Diversity management in New Zealand: Workers’ perspectives and responses’ Dr. Carla Houkamau, University of Auckland. Methodology seminar: ‘Demystifying epistemology & methodology’ - Assoc. Prof Lynne Giddings, School of Health Care Practice, Co-Director of the Interdisciplinary Trauma Research Centre and Gender & Diversity Research Group member, 14 April, 2011. Research symposium: Embraced by my ethnicity: Indigenous & ethnic minority staff in universities, 20 Oct, 2010. Key speakers: Dr. Edwina Pio, Dr. Antonio Andrade, Agnes Ngaera, Lorraine Parker, Ali Rasheed, Kitea Tipuna (AUT). Conference stream -initiated and convened: ‘Illuminating Eliminating Inequality Regimes’ at 3rd international Equality Diversity and Inclusion Conference, 14-16 July, 2010, Vienna, July. Co-Conveners: Dr. Judith Pringle, Dr. Irene Ryan, Dr. Candice Harris. Research seminar: ‘Equity and Diversity in Australian Organisations: Are women still working for the man?’ Professor Glenda Strachan, (Griffiths University) 23 March, 2010.